Artist's concept depicting the giant alien planet WASP-18b and its star, which are about 330 light-years away. A nearby star is not acting its age, thanks to the influence of a massive exoplanet. 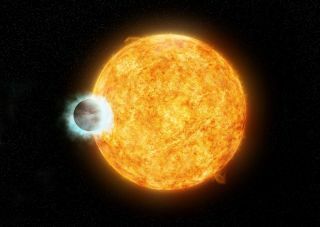 The close-orbiting alien planet, known as WASP-18b, is apparently disrupting the magnetic field of its host star so much that the object is behaving like a much older star, researchers said. The star WASP-18, which lies about 330 light-years away, is about as massive as our own sun. The gas giant WASP-18b weighs in at more than 10 times the mass of Jupiter and completes one orbit around the star in less than 23 hours, leading scientists to classify it as a "hot Jupiter." WASP-18b's tight orbit has led scientists to estimate that it may have only one million years of life or so remaining before it's destroyed by the parent star. Pillitteri's team targeted WASP-18 with NASA's Chandra X-ray Observatory and found it to be relatively quiet — a characteristic of older stars. Young stars tend to be more active, with stronger magnetic fields, larger flares and more intense X-ray emission. Stellar activity is connected to rotation, a process that slows with age. Observations of WASP-18 using Chandra revealed no X-ray emission. This by itself would suggest that the star has an age similar to the sun's 5 billion years, researchers said. However, Pillitteri and his team used other data as well as theoretical models to calculate that WASP-18 is actually just 500 million to 2 billion years old, and thus approximately 100 times less active than a star its age should be. The difference, the researchers determined, is due to the planet. "We think the planet is aging the star by wreaking havoc on its innards," said co-author Scott Wolk, of the Harvard-Smithsonian Center for Astrophysics in Massachusetts. WASP-18b's strong gravitational pull may be disrupting the star's magnetic field, researchers said. The planet's tug exerts forces similar to those imposed on Earth's tides by the moon, but on a much larger scale. The strength of a star's magnetic field depends on how much the hot gases within the star stir up its interior, a process known as convection. WASP-18 has a convection zone narrower than most stars, making it more vulnerable to the massive tidal forces exerted by WASP-18b, researchers said. "The planet's gravity may cause motions of gas in the interior of the star that weaken the convection," said co-author Salvatore Sciortino, also of INAF-Osservatorio Astronomico di Palermo. "This has a domino effect that results in the magnetic field becoming weaker and the star to age prematurely." The results were published in the July issue of the journal Astronomy and Astrophysics.